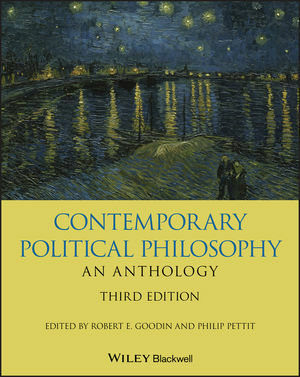 Unparalleled in the breadth and scope of its coverage, this newly-revised third edition traces the evolution of political philosophy as a contemporary practice, and raises important questions about the impact of current political events. ROBERT E. GOODIN is Distinguished Professor of Philosophy and Social and Political Theory at Australian National University and a Corresponding Fellow of the British Academy. The Founding Editor of The Journal of Political Philosophy, he has published many books, including A Companion to Contemporary Political Philosophy, Second Edition (Wiley Blackwell, 2012, with P. Pettit). His book Discretionary Time: A New Measure of Freedom (2008 with J.M. Rice, A. Parpo, and L. Eriksson) was awarded the International Social Science Council's Stein Rokkan Prize for Comparative Social Science Research. PHILIP PETTIT is L. S. Rockefeller University Professor of Human Values at Princeton University and Distinguished Professor of Philosophy at the Australian National University. He is fellow of the American Academy of Arts and Sciences and a Corresponding Fellow of the British Academy. Working in moral and political philosophy, and on background issues in the philosophy of mind, he is the author of a number of books, including On the People's Terms, which won the David and Elaine Spitz prize for 2014, and The Birth of Ethics, which appeared in 2018. 2 What Do We Want from a Theory of Justice? 13 Dealing with Difference: A Politics of Ideas or a Politics of Presence? 20 Are There Any Natural Rights? 27 What's Wrong with Negative Liberty? 35 What Is the Point of Equality? 46 Democracy: From City-States to a Cosmopolitan Order?